When thinking of cultural activities in a city, going to the movies, concerts or visiting some exhibitions are probably all one can think of. Although one of the merits of living in a city is a having a number of opportunities to experience cultural life, as a matter of fact there is not much diversity. Moreover, it has been a while since famous places in Seoul such as Hongdae or Myeong-dong showed their original features. They look almost the same, with streets full of franchise stores. It is actually hard to experience the local atmosphere in Hongdae any more besides watching people performing on the street. Nowadays, in response to the typical and limited city life, movement to look for daily and sustainable cultural activities is arising gradually. 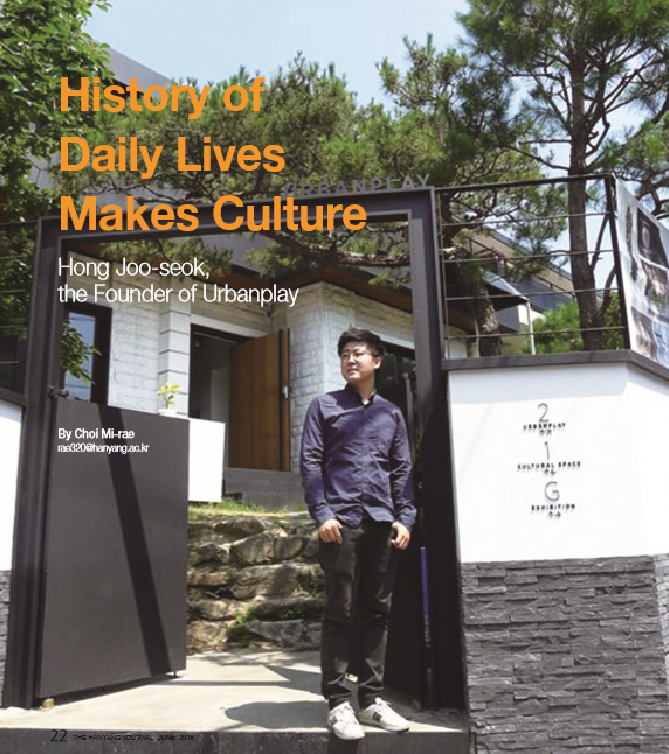 Hong Jooseok, the founder and Chief Director of Urbanplay is the one who is leading this trend. Q. What does Urbanplay have to do with cultural activities in city? A. Briefly speaking, Urbanplay is a company that coordinates events related to local culture. There are five different sections of tasks: City Happening, Place&Exhibition, Public Relations, Web&Design and Education. First, with regards to City Happening and Place&Exhibition, Urbanplay concentrates on finding cultural sources in urban places and organizes events so that people can experience those contents. Take the latest event that Urbanplay ran in May for example, it took place in Yeonhui-dong and was to introduce diverse crafts. It was like an open air museum that exhibited collections of buildings and artifacts outdoors. We made a network of 35 local craftsmen and exhibited their works at eleven places including the community service center, cafes, and galleries. People could walk through Yeonhui-dong and take part in activities or events in which they were interested in, such as flower arrangement classes, making card wallets and flea markets, for a certain fee. To publicize these kinds of events, we upload information about on our web magazine called Urbanpoly, in addition to uploading posts on our Instagram and Facebook account. This is where Urbanplay’s web design plays a role. Urbanpoly is not only a tool for public relations but also an archive of the small urban contents that are worth being known to the public. Lastly, Urbanplay also organizes projects like the Hangeul Learning Center in the National Hangeul Museum, contributing to the education of Korean culture on a larger scale. Q. Urbanplay seems to focus on the public values of culture which is not an easy path. What made you start such a business? A. I have been always interested in how people live their daily lives. I like to travel and used to go abroad every vacation back in university. I tried to experience the local atmosphere as much as I could. So I did not even bother to reserve hotels in advance or go to wellknown tourist sites. I did not visit the Louvre Museum while staying in Paris for over five days. Instead, I just walked around the city observing the people and different places like small towns. I got a lot of inspiration from those experiences. For example, I thought about the guest house culture in foreign countries which was not settled in Korea back then. It became the foundation for one of the projects in Yeonnam-dong that introduced ten unique guesthouses. Then graduate studies at Korea Advanced Institute of Science and Technology(KAIST) greatly influenced me to start what I am doing right now. Writing my research paper, I got to know the open air museum, a platform where people can experience culture visiting multiple spots in one area. Along with the open air museum, gentrification, a phenomenon where lower-income families and small businesses are losing their spaces due to increased property values, joined my interests in culture and future career together. So I made up my mind to do something related to culture and founded Urbanplay in 2013. To be honest, I am not the type of person who plans everything out and follows a schedule. I just started doing what I was fond of and thought it was worth a try with the people who had the same vision as I did. Making money by doing what one likes to do is the most ideal but is really hard to do in the current job market. However, I believe that more chances and opportunities are popping up and we can see more forms of work through social or independent media these days. I do not divide my work, leisure or interests into separate categories; I try to combine these three when it comes to working. Now I am thinking of traveling around the world in two or three years as I have been so preoccupied with work since I started my own company. As I have to make money at the same time, I am trying to come up with new foreign contents that can be introduced to Korea. It is like killing two birds with one stone. Of course the quality of the contents and projects must be good as well. Q. Doing what I like to do does not mean that I do not receive any stress from work. What are the difficulties you have gone through? A. When working on projects in the early days, I failed to consider the potential variables such as the weather, workforce and schedule which directly affect the budget in the end. It was because I did not have much field experience back then. As many Unrbanplay events are held outdoors, the weather is one of the most important factors. For example, during the project introducing guesthouses in Yeonnam-dong that I mentioned earlier, it rained for all three days. Once, our staff had to work on the construction of the venue for four nights and five days due to the lack of workforce. Now we have more flexible and effective skills than before. Communication is another crucial element to smooth operation and growth of the business. If communication among the staff members is not smooth, the whole procedure falls apart, like a snowball effect. Also, coordinating events without a conflict of interest requires communication skills too. No one can say for sure in advance that a project will always succeed. The key is to share the same goal; to make everyone understand the good purpose and positive effects of the project. Q. Culture is a broad concept that covers the entire world that we live in. What does culture mean to you? A. For me, ‘culture’ means something casual that has been accumulated in individuals’ daily lives. The history of each and every person’s life is really precious and the contents are definitely worth preservation and further development. However, culture businesses have been taking place under the name of tourism or housing development in rather violent ways. As a matter of fact, some people are concerned that the places where Urbanplay events or projects take place might become famous and crowded, following the footsteps of places like Hongdae. However, moving away from the style that shortsightedly emphasizes only economical aspects, I try to focus on the content itself. This works as a preventive measure of the gentrification of urban places. Urbanplay helps form communities of local people with diverse contents so that the contents can be made known to more people even if the places change in the future.